Remember i told you i am an Auditor of my bank and also the Chief of the International Relation Foreign Remittance Unit. Prior to my position here at my bank, i have the opportunity to loot out some amount of money of a deceased customer, whose autopsy result showed that he died as a result of gun shorts by unknown gunmen. As i was his personal accountant officer, before he died and from the account opening records, he did not indicate anybody as his beneficiary next of kin. Since 2008 to date, nobody has come forward as his beneficiary next of kin to administer the fund. The amount in question is the total sum of $:14.500,000. (Fourteen Million Five Hundred Thousand USD). I can provide all the required legal papers from the British Court to present you as the legal beneficiary to these funds if you would accept to partner with me in this deal. A lot of abandoned money lay around in this bank as a result of abandoned bank accounts, stock holdings, unclaimed life insurance pay-outs and forgotten pension benefits. I will definitely give you comprehensive details on how we would achieve this legally, without going against the laws of the country. Once you reply to me indicating your interest to work with me. I have worked with the bank for several years and have taken time to study the British inheritance claims procedures. I would appreciate it if you would treat this issue with every bit of confidentiality and maturity, putting my integrity foremost, because i wouldn' t need any mistakes or regrets. I assure you that you will never regret it if you would take the bold step to partner with me in this deal. It would be wise if we make every effort not to loose this golden opportunity. This happens in every bank around the world, even in your own country, but people outside the banking industry do not know this. The fund will be shared at the ratio of 58% for me, 40% for you and 2% will be set aside to cover any expenses and tax in your bank, We will use the fund there in your country to build companies and for investment which both of us would manage, Please this is an honest request for you and i. i only plead for you to make this transaction a top secret because we do not have to trust anybody unless you and i alone. This is to avoid mistake from your part , See the official letter below, send it through to the bank through the bank email address of the bank as follows. Immediately this fund is transferred into your account, then i will obtain visa to your country for the disbursement of the fund according to my proposal ratio, Immediately you apply update me that you have sent the letter to the bank. After his funeral celebration, i discovered that he have an unclaimed and balance account Fourteen Million Five Hundred Thousand United State Dollars. ($14.5 Million) deposited in your bank when he was alive. So i expect that your bank management will pay an urgent attention to my request and communicate to me further with the related forms and documents necessary to claim this above mentioned sum without delay. I apologize for late application for this claim as i have been arranging other things left since his sudden death occurred. 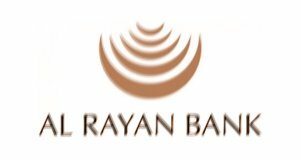 Yours sincerely. . . .
We wish to inform you our transfer department of Al Rayan BankUnited Kingdom, carefully received your official message in respect of our late customer funds. Note that you are expected to abide by the principles for us to finalize this transaction accordingly,You are therefore advised to view the TWO forms attached, fill the columns with the accurate information required for the immediate process of your claim. How are you doing together with your family, I hope all is well? Please bear with me that I am working on it to put all the necessary information in the form of official inquiry of deceased, I will like you to make an effort to see that this transaction is successful. This is a transaction that both of us need to be very careful to see that everything goes well. I could understand this is a matter of urgency, therefore see the deceased information below, use it to fill the official inquiry of deceased form and send back to the bank immediately. You should complete the next of kin ID form with your information and bank account details for the transfer. Please you should be very careful and hope that the success will be achieve soon. You should avoid mistake from your side. 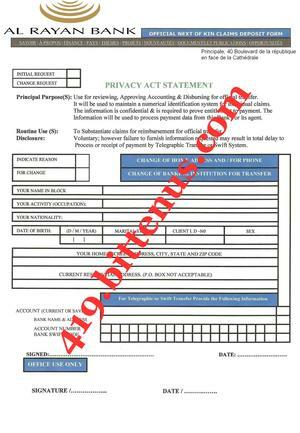 What you should do now is to print the forms out and fill it with pen and sign on it, then send it back to the bank today or first thing tomorrow morning because the bank gave condition for the return of the forms. I will wait to hear from you and my best regard to you and your family. The Next of kin ID form will be filled with your information and your bank details for the transfer as the bank directed. 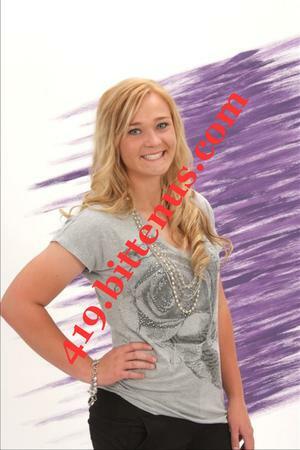 5: Deceased place / Date of Birth: Libya / Nov 1, 1944. Be notified that the management of Al Rayan Bank United Kingdom, is in receipt of the returned Official Deceased inquiry form with the correct information required. You therefore instructed after the Bank Executive Board of Directors meeting, before the Bank can be able to approve the fund in your favor as the benefited next of kin to the deceased, You are required to pass the second test by forwarding the following documents to the bank. 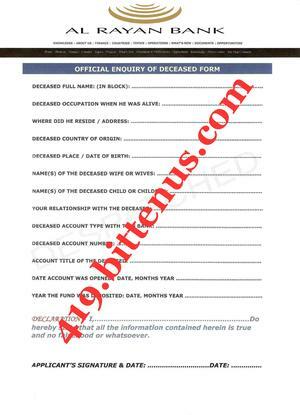 (1) The Death Certificate of the Deceased. (2)The deposit Certificate Issued to him on 16th August, 2004. (3) your National Identification Card or valid International Passport. We request for this stated documents with immediate effect to enable us to approve your request. OPTIONAL:- In alternative whereby you can not be able to come here and submit these certificate in person as our Financial Act 2003 demands, you have the lawful right as the successor to contact our Bank Financial Attorney to carry out the legal responsibilities on your behalf. 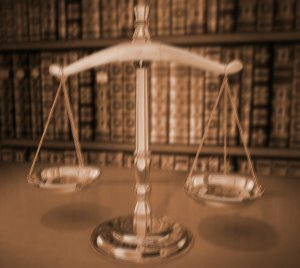 YOU ARE ADVICE TO CONTACT OUR ATTORNEY FOR POWER OF ATTORNEY AND AFFIDAVIT OF OATH / A NON-RESIDENT CERTIFICATE URGENT. Dear, i have heard what you said, go ahead and contact the lawyer as the bank directed so that he can be able to assist us and get the remaining documents, which is the last stage for the transfer, i hope you understand what i said? SEND THIS BELOW MASSAGE TO LAWYER NOW. However, the bank wants me to come down in person, but due to the business schedule, I will not be able to come down in person at the moment. The bank have giving me Option of contacting you. The bank requested. .
Sir, i believe you will assist me in obtaining these documents from the Government Institution who's dealing with these documents and hand it over to the bank. I will appreciated it if you can send me also copies of the documents for that fact I must also prove these documents into the receive of revenue for tax purposes here in my country, The money is with Al Rayan Bank Plc United Kingdom For further information you can contact me. First of all you are to send your international passport or your national Id card for identification, and your direct private telephone number for easy communication and the name of your country of origin, your full name and your date of birth. In receipt of this data, you will be required to sign a legal power of attorney, after we receiving all the relevant information' s from you, Which Will empower this law firm before the bank in any necessary question to render my service legally to ensure i get the Mentioned documents from Royal Court of Justice(RCJ) successfully. (1) Registration of your Particulars. . . . . . . 50 British Pounds. (2) Application Stamp Duty Fee. . . . . . . . 50 British Pounds. Sir, be informed i will proceed with this legal documents once i confirm the payment as the rule of my law firm demand, get back to me once you are ready for the legal fees to enable me to give you the information' s you will use to depsit the money, my duty is to give all my client the best of my service. With all due respect i wish to write in accordance to your mail, Sir, you will deposit the legal fees through Money Gram Or Western Union Transfer Agency, to enable my secretary to receive the money on my behalf due to my legal activities as i explained in my previous mail. Sir, inform me once you deposit the money with the payment slip you got from Money Gram Transfer Office, after the transaction to enable my secretary to confirm the payment here. Which i will legally advice you to ensure you send the moneytomorrow as i instructed, so that i can be able to get the documents ready in the next 2 working days due to the bank next of kin constitution, get back to me once the payment is made to enable me to proceed effectively.